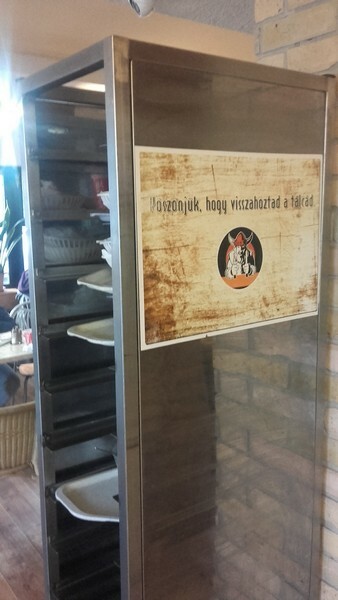 Intermediate Hungarian: what does this sign say? You are here: Home / signs / Intermediate Hungarian: what does this sign say? May 4, 2017 By Let's Learn Hungarian! I found this sign in a restaurant in Budapest. What do you think it says? Test yourself below, then see underneath for the answer! Also, is this in familiar or formal Hungarian? Köszönjük, hogy visszahoztad a tálcád. Thank you for not smoking. We appreciate your service. Thank you for returning your tray. Maybe this picture of the sign in a larger context will help you figure it out! Answer: Thank you for returning your tray. Let’s break this down word-by-word! Köszönjük, hogy visszahoztad a tálcád. = Thank you for returning your tray. I didn’t know tray, but the rest was no problem.